At EQUO, a strong commitment to community consciousness is at the core of many of our business decisions. As we continue to expand our line with the launch of our breech, it seemed like a logical step for us to incorporate an element of giving into our launch promotions. EQUO US (http://equo.com), a premier line of premium equestrian lifestyle apparel and accessories, has announced the Share The Love Breach Drive as the company’s giving arm, EQUO Fund’s, latest initiative. CORRAL Riding Academy, the partner recipient in the drive, provides therapeutic and academic intervention for young women who have been subjected to abuse, neglect, or poverty. 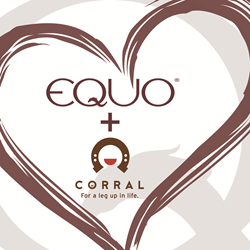 CORRAL stands for “Centered on Riding, Rehabilitation and Learning.” The organization uses Equine Assisted Psychotherapy (EAP) to create positive interactions with rescued horses. EAP sessions are guided by Mental Health professionals, and CORRAL’s therapy horses are able reach at-risk young women in ways that others in their lives cannot. Each EQUO product is tested by a team of trusted professional and amateur ambassadors at each step, from initial sketches to final prototypes, to ensure that all final products can stand up to the demands of our athletes’ active lifestyles. For more information about EQUO, including retail locations or to shop online, visit http://equo.com. Founded in 2016 by a team of lifelong equestrians, EQUO (http://equo.com) strives to create the highest-quality, most durable, and most stylish equestrian lifestyle apparel and accessories for active and discerning athletes and enthusiasts. Each product is tested by a team of trusted ambassadors at each step, from initial designs through final prototype, to ensure that any product in our shop meets the needs and wants of our community’s active lifestyle. Founded in 2009, CORRAL Riding Academy is a non-profit serving at-risk girls age 11–17 in Cary, NC. CORRAL is a long-term intervention designed to shepherd girls through their difficult middle and high school years and into college. CORRAL relies heavily on the power of rescued horses to help girls heal, supporting and challenging each girl according to her individual needs. CORRAL provides Equine Assisted Psychotherapy, tutoring, vocational training, riding instruction and mentoring during after school hours, all at no cost. CORRAL equips girls to take ownership of their choices, so they can apply what they learn and lead healthy, productive lives long after they leave the farm behind.